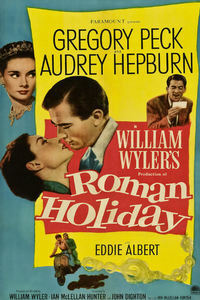 February 14 ~ Roman Holiday. Valentine's Day doesn't get much better than cocktails + a screening of this classic 1954 RomCom starring Audrey Hepburn and Gregory Peck. Overwhelmed by her suffocating schedule, touring European Princess Ann takes off for a night while in Rome. When a sedative she took kicks in, however, she falls asleep on a park bench and is found by an American reporter who takes her back to his apartment for safety. After learning of Ann’s regal identity he bets his editor he can get an exclusive interview with her, but romance soon gets in the way. Bambi's Bar at the Playhouse Cafe will be offering a 2-for-1 drink special to top it off...CHEERS!